A simple technology was developed for the isolation of insecticidal molecules from cassava leaves and tuber rind. 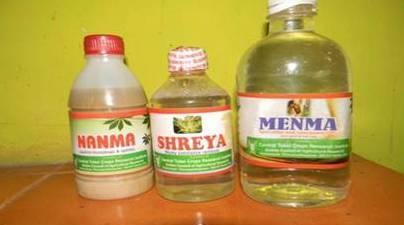 Three formulations Nanma, Shreya and Menma were developed. This can be used against very noxious borer pests like pseudo stem weevil in banana, red palm weevil of coconut and a spectrum of stored-product insect pests and other borer pests of tree and fruit crops. It is also contemplated to utilize the leaves, after the extraction of insecticidal principles, as a component of animal feed, as this contains high amount of protein. •	Eight litres of biomolecules can be developed from one kg of cassava and the cost is also too low, only Rs. 20 is needed for making one litre bimolecule. •	The biggest advantage that these products have over their synthetic counterparts is that unlike in the latter case, most infected plants do not develop a resistance to these products over time as they have been derived from natural sources. Spraying of Monocrotophos or dimethoate @ 0.05 % at monthly intervals or spraying water at 10 days interval from January to march. Ce-2, Ce-4, Ce-14, Ce-38, Ce-139 S-856 are resistant to spidermites. 3) Cultural methods like earthing up, providing irrigation, crop rotation etc. 4)Spraying the crop at monthly intervals with 0.05 % of fenitrothion or fenthion ormonocrotophos is effective. orSoil drenching withfenthion, endosulfan, quinalphos, monocrotophos and fenitrothion 0.05 % at 50 & 70 DAP. 1.Folpet 0.2% or Dithane-M45 0.2% spray at fortnightly intervals from first appearance of disease. Four sprays may be required. 2.Use healthy corms for planting. 3.Remove and burn diseased ones. 4.Use a tolerant variety like Muktakesi, Jankhari, Nadia local or topi. 5.To escape from disease infection planting of early maturing varieties during May for rainfed crop and during February/March for irrigated crop. 1.Cultural practices like crop rotation,Removal of plant debris and Improving drainage. 2.Soil drenching around the plant with benzimidazol 0.05%. 2.Resistant varieties (CTCRI varieties are resistant). 4.Prophylatic spray of Bordeaux mixture. Plant resistant varieties like H-97, H-165, H-2304 . Use Meristem tip culture technology to eliminate Cassava Mosaic Virus from infected plants. 1.Field rats : Field sanitation, use of traps, poison baiting using 2% zinc phosphide mixed with rava, sugar and oil (90:5:3), fumigating the burrows using aluminium phosphide tablet 3-6 g/burrow, smoking the burrows using coconut leaves. 2.Management in store	: Rat proofing by covering ventilators and windows by gauge, wire netting and blocking all unnecessary openings. Sanitation of the store and its surroundings, use of traps, use of acute (single dose) poisons such as zinc phosphide or anticoagulants (multi dose) such as bromadioline.